Be your best, happy friend. That may sound a bit funny to you, but it holds some great advice. We all know that deep, quiet satisfaction is the very stuff we are made of. Peaceful happiness is available to us at all times. There is never a moment that it is not available. Everything you need is in the quiet of you. 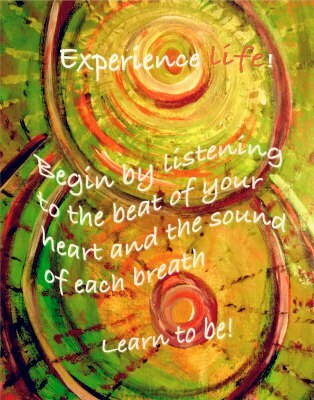 One of the tools for locating the happiness within is to listen to the sound of each breath, become aware of your heartbeat. What a loyal friend is your heart! Consider your age. How many years has your heart been beating? It is estimated that over an average of a 66-year-lifespan the heart beats 2.5 billion times. The heart beats and your lungs exchange carbon dioxide for oxygen to nourish your blood supply whether or not you think about it. These systems are available to you free-of-charge throughout your lifetime. So is peace, joy and happiness. Happiness is always available to you, free-of-charge. There is no external thing, like a new house, a new job, new clothes, a new friend or loved-one, that can bring you happiness because you already own an unlimited supply of happiness. It is the fabric of who you are. You are the energy of happiness! You can restrict your flow of happiness with negative thoughts just like you can cover your airways to prevent oxygen to enter your body. If you cannot experience happiness simple remove the clamps of negative thinking. Pay attention to each breath and realize there is more to you than you ever imagined. Take a moment to still all thoughts and reach inward to your best friend, you. Next Next post: Happy Autumn Is Here! Barb you are awesome and right on. Happiness is within!